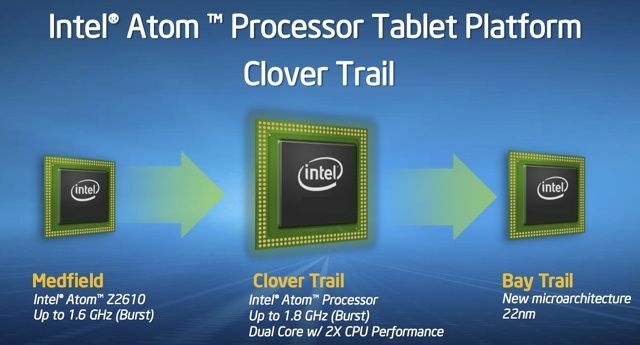 Intel has formally launched Clover Trail, its upcoming Atom system-on-a-chip for Windows 8 tablets. Officially branded the Atom Z2760, Clover Trail contains a dual-core x86 CPU capable of running at up to 1.8GHz in burst mode - maximise the clock frequency as far as the chip's temperature will allow - and equipped with HyperThreading so the tablet operating system thinks it's running on a four-core processor. 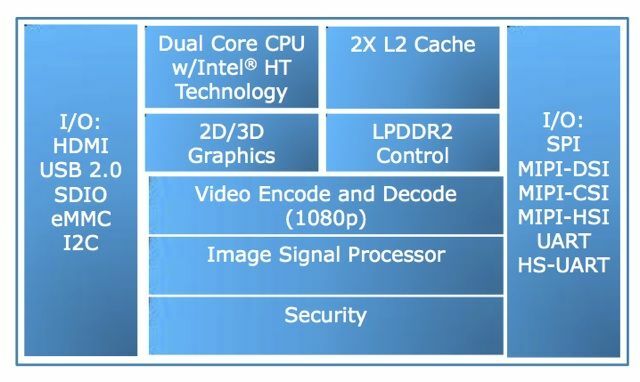 The 32nm SoC also contains a 533MHz Intel graphics core plus 30fps 1080p capable video encoding and decoding engines. Add to that I/O controllers for all the device's key interfaces, including USB, up to 64GB of Flash storage, LP (low-power) DDR 2 memory, HDMI 1.0, cameras of up to 8Mp, NFC and SD, plus support for location and orientation sensors, and you have the Atom's feature set. The chip giant claimed the Z2760 will enable gadgets as "thin as 8.5mm and as light as 680g". The technology also provides long battery life: over ten hours on-panel HD video playback - as opposed to HDMI - and over three weeks of standby time, Intel claimed, though that depends on the battery it's hooked up to. In the case of Intel's test, the basis for the above claim, it used a 30Wh cell. The Z2760 has made an appearance in Passmark Software's CPU benchmark database, scoring 705 points. That puts it on a par with the netbook-oriented Atom N2800 (709 points) and a 2.66GHz Pentium 5 (705). Desktop Atoms beat it by a fair margin: the 2.13GHz Atom D2700 scores 833, for example. Intel talked about the part's internals earlier this month at Intel Developer Forum (IDF) where it also pointed to Clover Trail Plus, the smartphone-oriented version of the platform. While it didn't formally announced the Z2760, it did claim the part had been designed "from the ground up" for Windows 8.